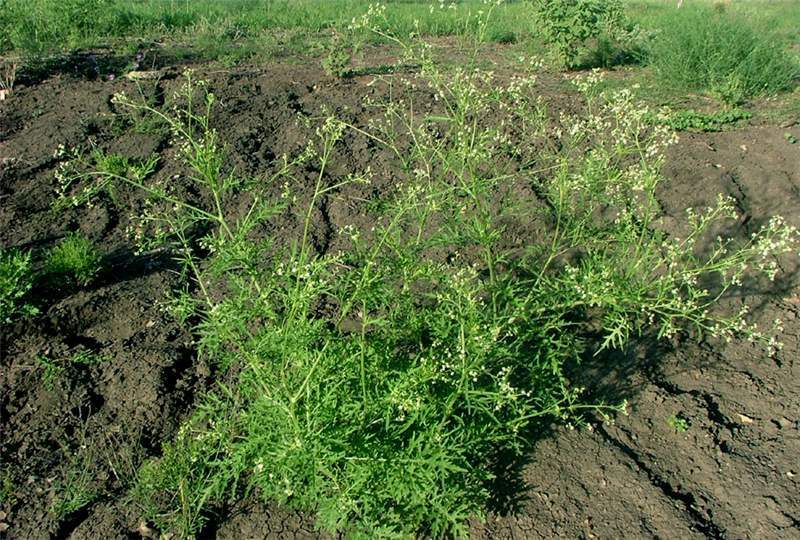 Parthenium weed, bitter weed, bitter-broom, bitterweed, carrot grass, congress grass, false camomile, false ragweed, feverfew, parthenium, parthenium weed, ragweed, ragweed parthenium, Santa Maria, Santa Maria feverfew, white top, whitehead, whitetop. Native to Mexico, Central, South America and the Caribbean. 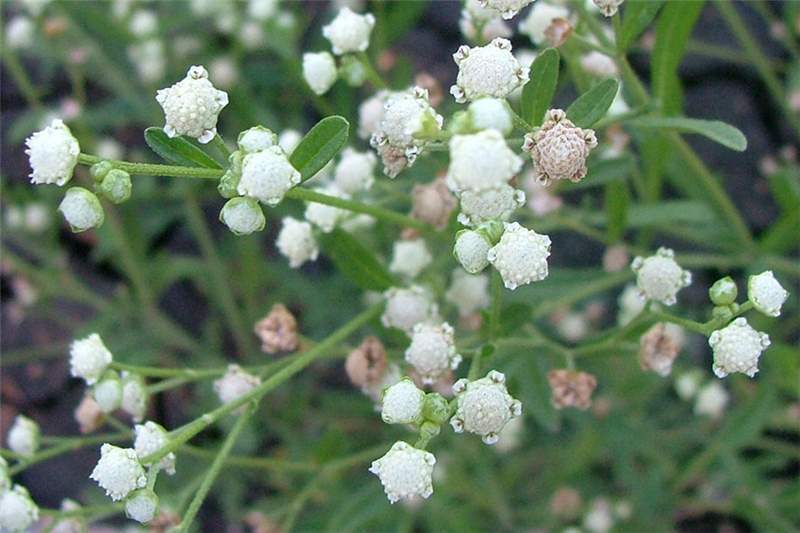 Locations within which Parthenium hysterophorus is naturalised include the Indian sub-continent, south-eastern Asia, tropical/subtropical Australia, eastern USA, southern and eastern Africa, Madagascar and many oceanic islands with warm climates. 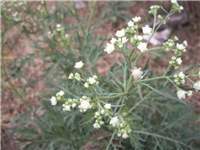 Parthenium hysterophorus is invasive in Kenya, Uganda and Tanzania (A.B.R. Witt pers. obs.) The species is fast spreading in Kenya where it has been recorded in coffee plantations around Kiambu and Nyeri districts, around Nairobi city, Kajiado and Naivasha. Recent reports indicate that, P. hysterophorus has spread into Masai Mara and the Lake Victoria basin in Uganda and Kenya. Many district of Uganda have been infested in the last 2 or 3 years (2008, 09, 10) and parts of Arusha in northern Tanzania are currently invaded by this species. 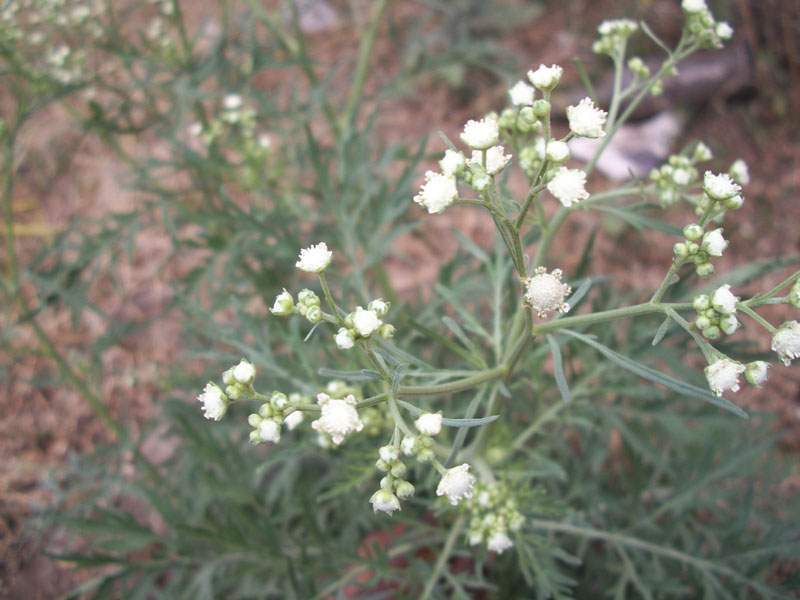 Parthenium hysterophorus is a weed of semi-arid, subtropical, tropical and warmer temperate regions. It is found in riparian zones (banks of watercourses), on roadsides, along railways and in pastures, seasonal floodplains, grasslands, open woodlands, waste areas, disturbed sites, lawns, gardens and crops. It is particularly aggressive in degraded or disturbed pastures in semi-arid environments. 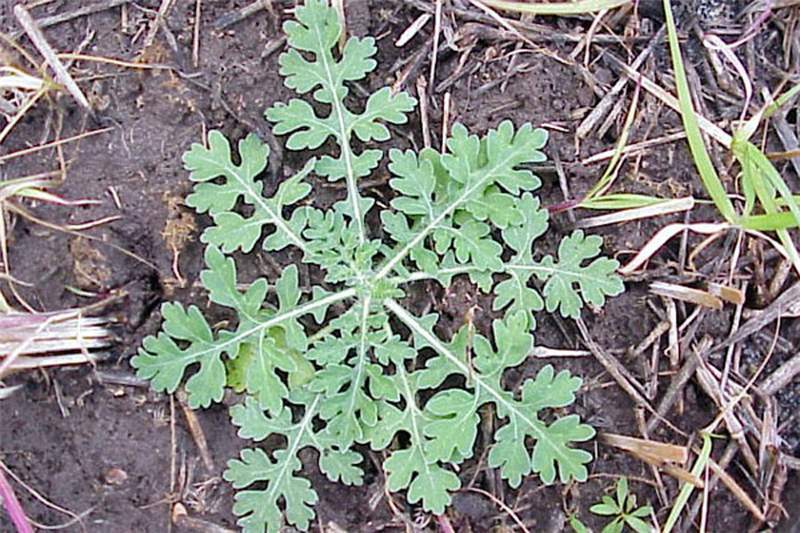 Parthenium hysterophorus is a much-branched, short-lived (annual), upright (erect) herbaceous plant that forms a basal rosette of leaves during the early stage of growth. It usually grows 0.5-1.5 m tall, but can occasionally reach up to 2 m or more in height. 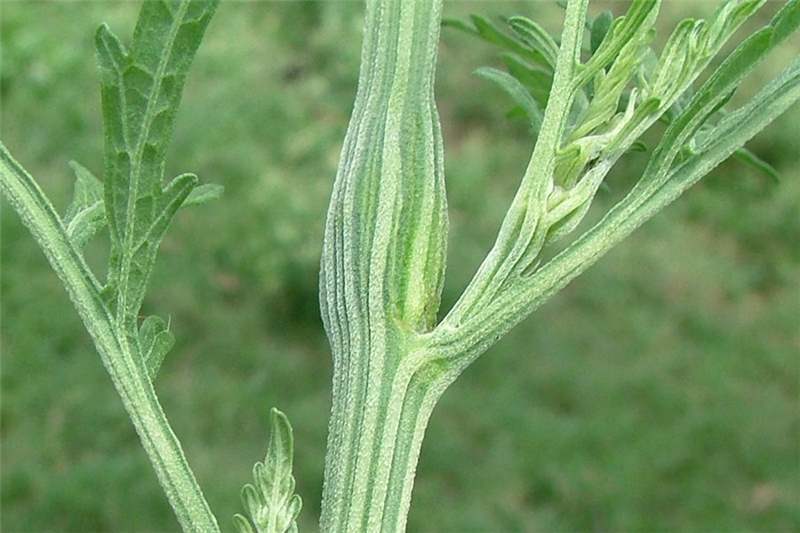 Mature stems are greenish and longitudinally grooved, covered in small stiff hairs (hirsute), and become much branched at maturity. 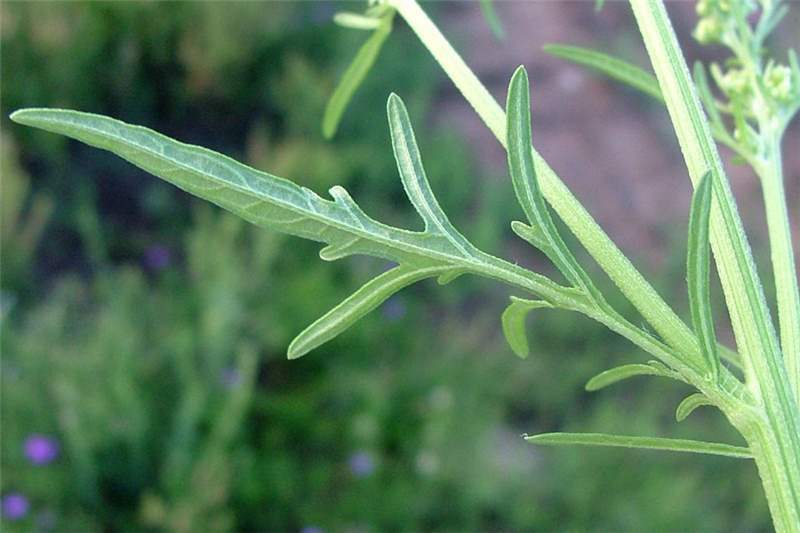 The alternately arranged leaves are simple with stalks (petioles) up to 2 cm long and form a basal rosette during the early stages of growth. The lower leaves are relatively large (3-30 cm long and 2-12 cm wide) and are deeply divided (bi-pinnatifid or bi-pinnatisect). Leaves on the upper branches decrease in size and are also less divided than the lower leaves. The undersides of the leaves, and to a lesser degree their upper surfaces, are covered with short, stiff hairs that lie close to the surface (they are appressed pubescent). Numerous small flower-heads (capitula) are arranged in clusters at the tips of the branches (in terminal panicles). Each flower-head (capitulum) in borne on a stalk (pedicel) 1-8 mm long. These flower-heads (4-5 mm across) are white or cream in colour and have five tiny 'petals' (ray florets) 0.3-1 mm long. They also have numerous (12-60) tiny white flowers (tubular florets) in the centre and are surrounded by two rows of small green bracts (an involucre). Colour changes to light brown when seeds are mature and about to shed. Flowering can occur at any time of the year, but is most common during the rainy seasons. 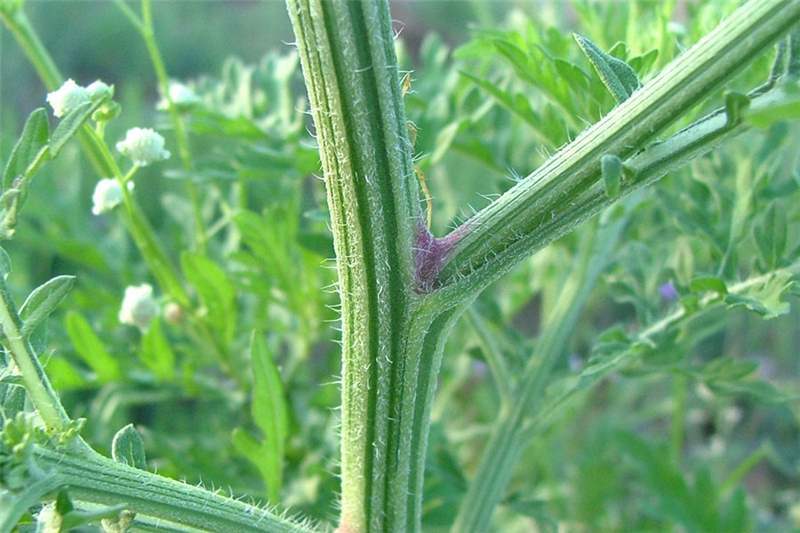 Five small 'seeds' (achenes) are usually produced in each flower-head (capitulum). These achenes (1.5-2.5 mm long) consist of a black seed topped with two or three small scales (a pappus) about 0.5-1 mm long, two straw-coloured papery structures (actually dead tubular florets), and a flat bract. 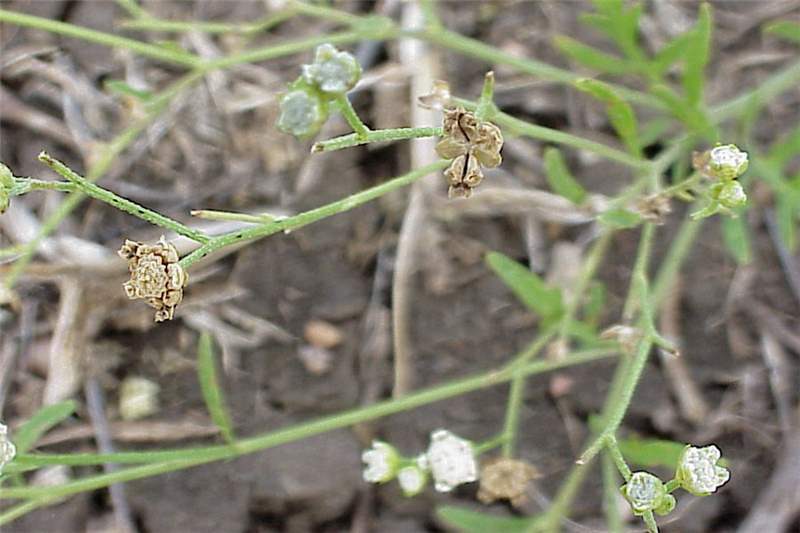 Parthenium hysterophorus reproduces by large numbers of seed:. 10 - 25, 000 per mature plant. These seeds are dispersed by wind, water, animals, vehicles, tools and machinery and on clothing. They are sometimes also spread in mud and contaminated agricultural produce (e.g. fodder and food grains). 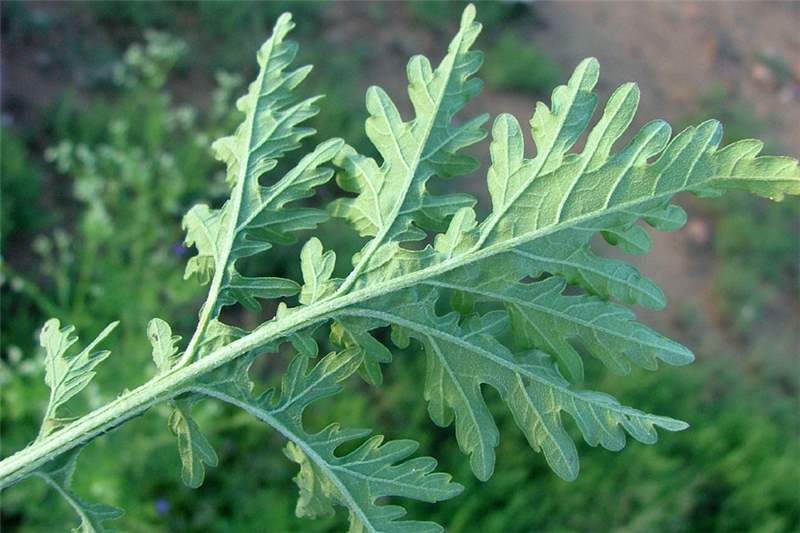 Parthenium hysterophorus can be confused with Ambrosia artemisiifolia (annual ragweed), Ambrosia psilostachya (perennial ragweed), Ambrosia confertiflora (burr ragweed) and Ambrosia tenuifolia (lacy ragweed) when in the vegetative stage of growth. However, P. hysterophorus can be distinguished from all these species by its ribbed stems, and also by white flower-heads (capitula) when it is in flower. 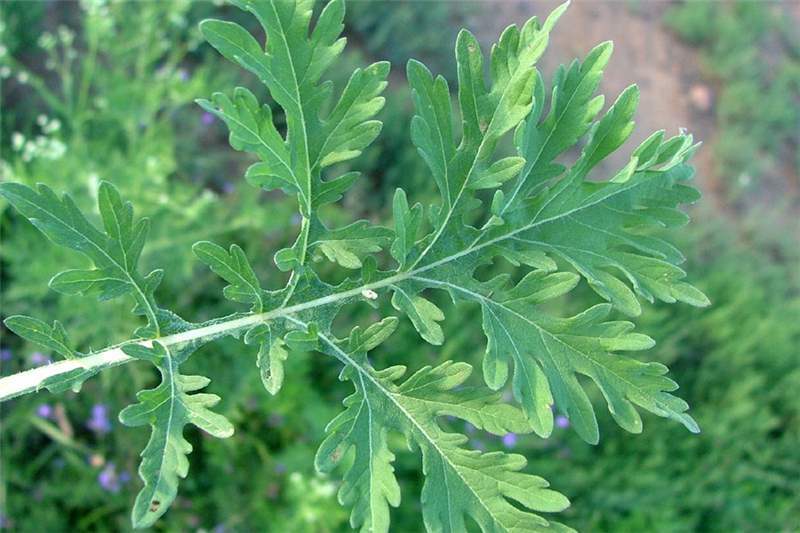 Parthenium hysterophorus has some traditional medicinal uses but this use However, these uses cannot compensate for this plant's overall negative impacts. Parthenium hysterophorus has been reported to cause skin rashes (dermatitis), on those parts of the body that come in contact with the weed on a regular basis, watery eyes, swelling and itching of the membranes of the mouth and nose, constant coughing especially at night, continually running nose and sneezing, itching of the roof of the mouth and fatigue. Allergy-prone people are particularly susceptible to both the dermatitis and respiratory problems. The weed is unpalatable to livestock so its invasion results in grazing shortages. If it is mixed with fodder, it taints meat and milk. In southern Africa, this weed is particularly problematic in sugarcane and banana plantations. 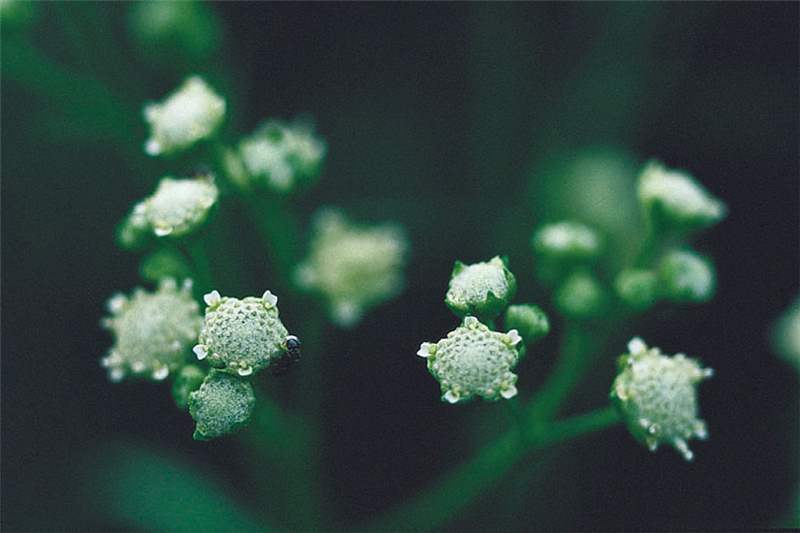 It produces allelopathic substances that deter other plants from germinating and growing near it - and hence can "take over" native grassland and improved livestock pastures as well as the understory in woodlands. Ethiopia is currently the worst affected country in the region. P. hysterophorus is currently considered to be the most important weed both in croplands and grazing areas by 90% of farmers in the lowlands of Ethiopia (Tamado and Millberg 2000) with sorghum yields being reduced by 97% in experimental fields with high densities of P. hysterophorus (Tamado et al. 2002). The impact of this species has also been well documented in Australia and India (Evans, 1997) where studies have revealed that P. hysterophorus is allelopathic and that infestations reduce crop yields and that the weed displaces palatable species in natural and improved pasture (Channappagoudar et al. 1990). In terms of animal husbandry it has also been reported that this noxious weed can reduce pasture carrying capacities by as much as 90% (Jayachandra 1971). P. hysterophorus has been included in the Global Invasive Species Database (GISD 2010). It has been listed as a noxious weed in South Africa (prohibited plants that must be controlled. They serve no economic purpose and possess characteristics that are harmful to humans, animals or the environment) and in all Australian states. To control this weed, it is recommended to pull out the plants before they flower, making sure to remove all of the root system to avoid regrowth from root remnants. Use lightweight, long sleeved garments and cotton gloves to avoid contact with the skin. A number of herbicides (foliar applications) registered for use against this weed elsewhere in the world When using any herbicide always read the label first and follow all instructions and safety requirements. If in doubt consult an expert. The best method of control is to maximise competition against the weed by maintaining good grass growth, which requires exclusion of grazing livestock until grass has become re-established, followed by reduction in stocking rates to prevent reinvasion by the weed. Biological control offers the prospect of sustainable control of P. hysterophorus. Agents have been released in Australia and parts of Asia with some success. South Africa has applied for release of agents and trials are ongoing in Ethiopia. 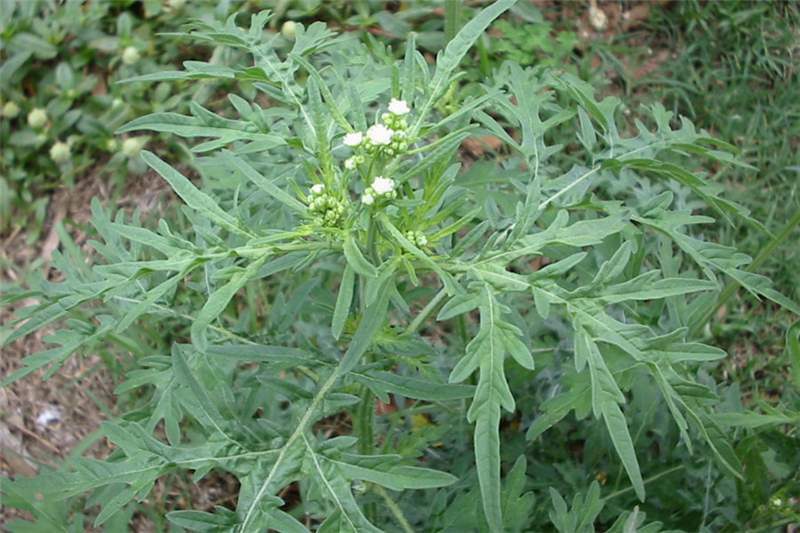 Parthenium hysterophorus was declared a noxious weed in Kenya in 2010 under the Suppression of Noxious Weeds Act (CAP 325). Under this act the Minister of Agriculture, can compel land owners who have such declared noxious weeds growing on their land to remove or have it otherwise removed. However, this species is not declared in Uganda and Tanzania. CABI Invasive Species Compendium online data sheet. 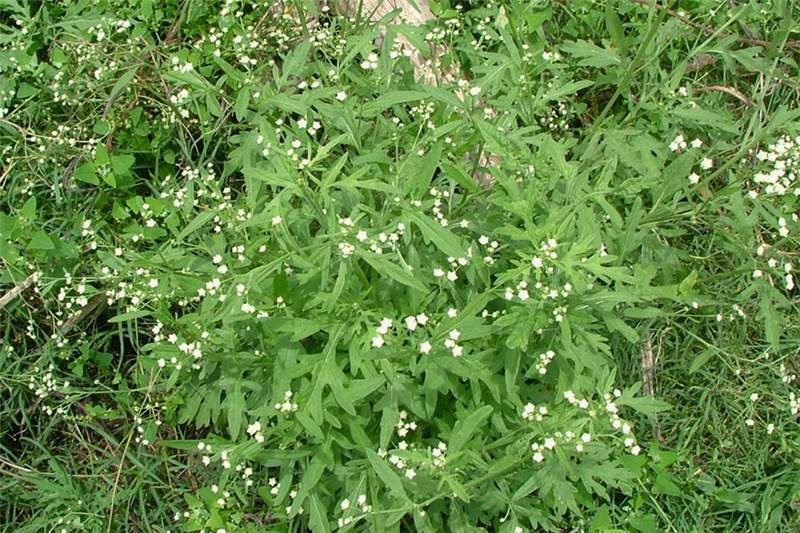 Parthenium hysterophorus (Parthenium weed). CABI Publishing 2011. www.cabi.org/ISC. Accessed March 2011. Evans, H.C. (1997). 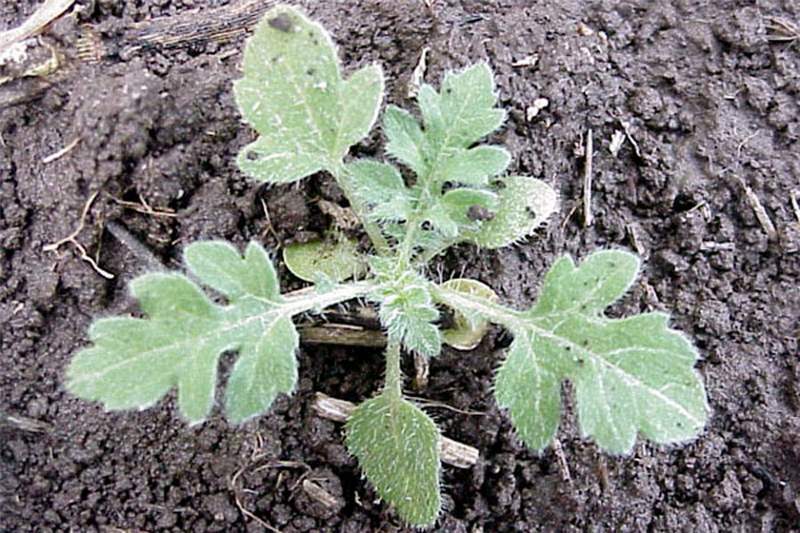 Parthenium hysterophorus: a review of its weed status and the possibilities for its control. Biocontrol News and Information 18(3), 89-98. Jayachandra, J. (1971). Parthenium weed in Mysore State and its control. Current Science 40, 568-569. GISD (2010). Global Invasive Species Database online data sheet. Parthenium hysterophorus (herb). www.issg.org/database. Accessed March 2011. Global Compendium of Weeds. www.hear.org/gcw. Hawaiian Ecosystems at Risk Project. Accessed March 2011. Lazarides, M., Cowley, K. and Hohnen, P. (1997). CSIRO Handbook of Australian Weeds. CSIRO Publishing, Collingwood, Victoria. Matthews, S. and Brandt, K. (2004). Africa Invaded: The growing danger of invasive alien species. Global Invasive Species Programme. Pacific Island Ecosystems at Risk (PIER). 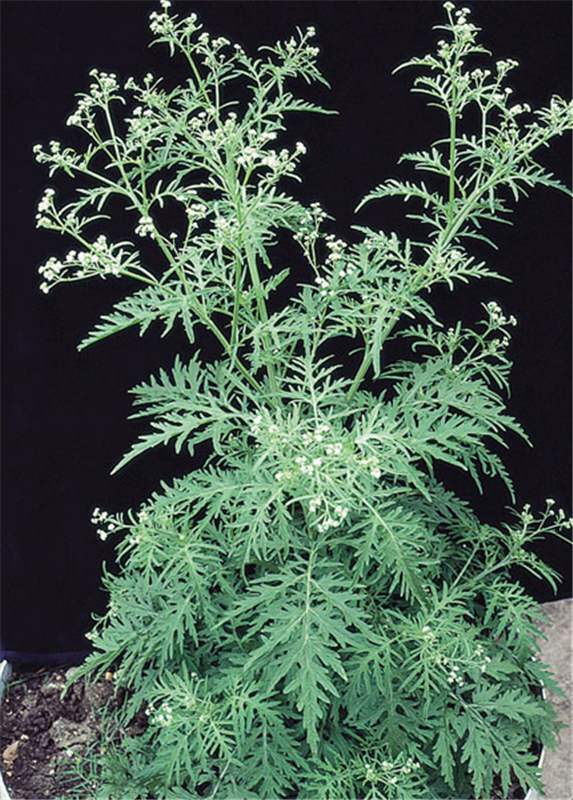 Parthenium hysterophorus L., Asteraceae: plant threats to Pacific ecosystems. www.hear.org/pier/species/parthenium_hysterophorus.htm. Institute of Pacific Islands Forestry, Hawaii, USA. Tamado, T. and Milberg, P. (2000). 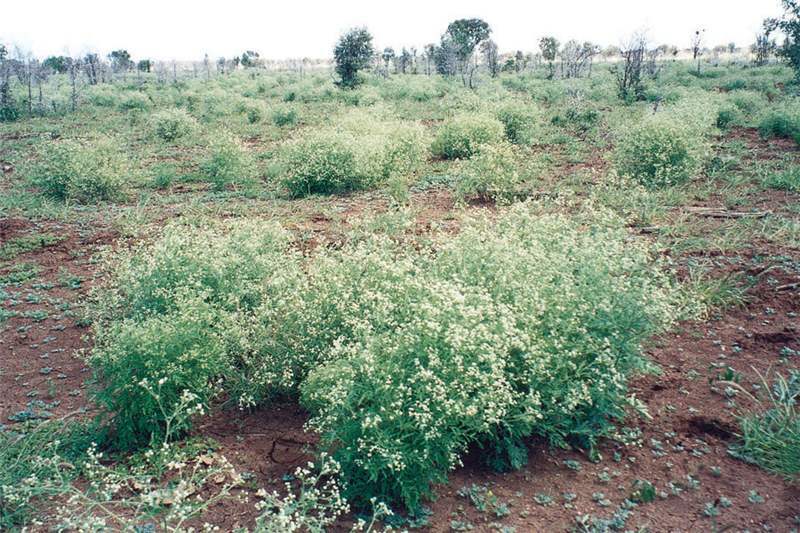 Weed flora in arable fields of eastern Ethiopia with emphasis on the occurrence of Parthenium hysterophorus. Weed Research 40, 507-521. Tamado, T., Ohlander, L. and Milberg, P. (2002). Interference by the weed Parthenium hysterophorus L. with grain sorghum: influence of weed density and duration of competition. International Journal of Pest Management 48(3), 183-188.